Solemn and lofty celebrations; intense training; beautiful, contemplative Gregorian chant, new friendships and a warm atmosphere—this is the short summary of the international liturgical workshops „Ars Celebrandi”, launched July 12th at the Sanctuary of Our Lady of Sorrows in Licheń (Poland). The workshops of the traditional liturgy „Ars Celebrandi” in Licheń, organized by the association Una Voce Polonia (Polish branch of the International Federation „Una Voce”, an organization recognized by the Holy See as the official representation of secular Catholics attached to the traditional Latin liturgy), are held for the fifth time. 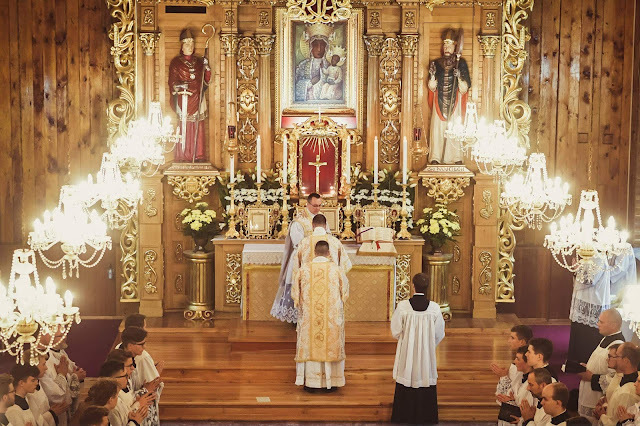 About 200 people from Poland and a dozen or so countries around the world, including Estonia, Latvia, Germany, France, Byelorussia, or even South Korea, learn to celebrate the Mass in the extraordinary form of the Roman rite (priests), serve it (altar servers), or sing (male and female Gregorian chant consorts). The visit of the high-ranking Vatican prelate, Archbishop Guido Pozzo, secretary of the Pontifical Commission Ecclesia Dei (responsible for Catholics attached to the traditional liturgy around the world), will be the most important event of this year’ edition. On July 18 he will celebrate a pontifical Mass in the Basilica of Our Lady of Licheń and will hold a meeting with the participants of the workshops, answering their questions. From this year on, “Ars Celebrandi” workshops are officially an international event: one of training groups for altar servers is held in English. This innovation was introduced in response to requests addressed to the organizers. The priests have an unusual opportunity to improve their priestly singing under the direction of a Benedictine monk in charge of liturgical singing in the thousand-year old Benedictine Abbey in Tyniec (Cracow). Another important point is the presence of the Dominican rite—more than 750 years old own liturgy of the Order of Preachers (very popular in Poland); and the opportunity to participate in the so-called „Polish Masses” celebrated with the accompaniment of the once popular and now almost forgotten devotional folk unison songs. The workshops are organized in a way enabling everything: prayer, learning and entertainment... well, except for rest. The plan of the day starts at 6 a.m. with singing lauds (the morning office), and ends in the late evening with a sung complete (not forgetting—for those willing—additional workshops, lasting up to midnight). However, the time for coffee meetings and making new contacts has been also provided („Ars Celebrandi” makes a great contribution to the integration of the Latin liturgy communities of different towns and countries), and even to watch the finals of the World Cup on football. The enthusiasts of the old liturgy are not alienated from life and stand firmly on the ground. The event takes place from 12th until 19th of July. Daily releases and photo galleries are being published on Facebook and Instagram.